Room size: 15' x 30' x 9' opening to 3 other rooms, short wall setup, suspended wood floor, sheetrock walls and ceiling. Stepping out of one's area of expertise and comfort zone is always risky business for an established company. Although not impossible, examples of electronics experts successfully entering speaker design and vice versa are rather rare. Over in Europe GamuT is certainly such an example of 'trans-genre' excellence and in the US, PBN has collected accolades for both their speakers and amplifiers but similar efforts by Esoteric, McIntosh or Consonance to just name a few have not always been as successful. Genesis' first foray outside the speaker world and into thermionic amplification was rather well received; both Srajan and Paul lauded the qualities of the now discontinued M60 and I60 respectively - yet despite their success and quick sell-out, those two amplifiers developed in partnership with the Sino-Australian company Melody did not completely satisfy Genesis' owner Gary Koh who set to design a from the ground up perfect line of amplifiers not only for his speakers but any speaker that can't be satisfied with just a handful of watts. As it turns out, I happen to own just the right speakers for such a challenge. Despite their 89dB sensitivity, the Nomad Audio RPDs require huge amounts of current to get their sealed ten-inch woofers under control. It's a task even the McIntosh MA2275 finds impossible at times. Of all the amplifiers I own, the RPDs are only mastered by the Musical Fidelity A5 and its 60 amps of current capacity. Because of their tremendously revealing nature in the midrange and treble, the RPDs won't accommodate brutes without finesse either. More than one solid-state powerhouse has stumbled over their implacable top-end transparency. To say that I was tickled by Mr. Koh's promise of unflinching power, control and dynamic with rich, sweet, tube-like tonal textures would be an understatement. As I was working my way through the review of Esoteric's P05/D05, I patiently waited for Genesis to iron out the last pre-production wrinkles and send one of the first amplifiers my way. Genesis' new amplifier line starts with the 180-watt stereo GR180 at $4,850 followed by the 360-watt stereo GR360 costing $7,650 and topped by the 360-watt M360 monoblocks at $12,680/pr. But that's only the beginning of the story. Each amplifier can be upgraded by adding an optional $3,850 Maximum Dynamic Headroom Reservoir (the monoblocks obviously take one each, bringing the upgraded pair to a healthy $20,380). As the MDHR was not available during my time with the GR360, it will be the object of a separate followup. Similarly, the GR360 I received was the balanced version available first. Mr. Koh is putting the finishing touches to a single-ended version of the amplifier which could be available at the same time as the MDHR later this year. Should that be the case, I would follow up on it as well. At this point, I need to break the news to you. 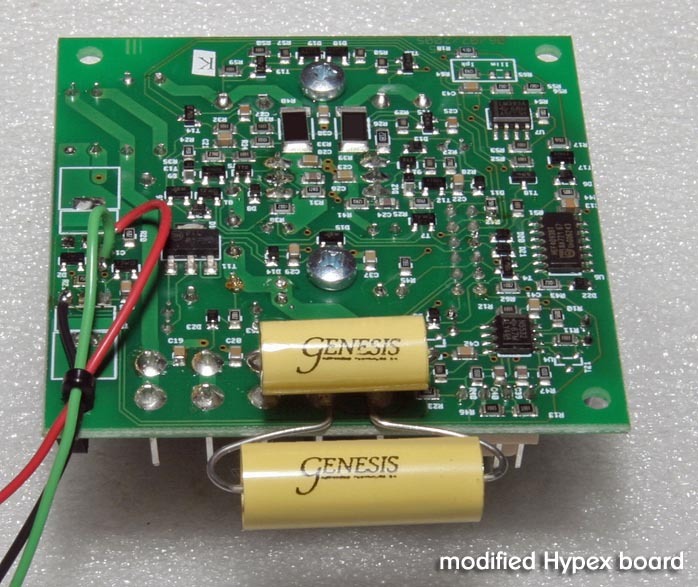 The Genesis Reference amplifiers are based on the popular Hypex modules and therefore class D. This statement alone will probably cause a number of reactions. If you have been exposed to the latest developments by Bel Canto or NuForce, class D probably rings as a promise of excellence. Conversely, for a lot of people burnt by the edginess of the early implementations or only exposed to less than exalted examples of the breed, class D may just mean "cheap", "bright", "for use in home theater or subwoofer amplifiers only" to quickly bring up the fair question "and are they out of their minds asking for that much money for an off-the-shelf amplifier?" There, the cat is outa the bag. If you care to read further, I'll try and prove that there is nothing off the shelf about the GR360 - not its design, not the quality of its implementation and certainly not its sound and musicality. Actually, it's one of the finest amplifiers I have been privileged to listen to regardless of price, technology or class of operation. Right out of the box, the GR360's physicality is actually underwhelming - a thin and relatively light rectangular box with a black front plate is all you'll see until you figure out that both the suspension mechanism and power supply shipped separately. Assembling the suspension is a matter of minutes (two, maybe five maximum) and connecting the power transformer to the amplifier with the provided locking cable is a snap (it literally snaps in place). Genesis recommends keeping the massive transformer as far from the amplifier as possible and in doing so, I heard absolutely no noise, hum or interference through the speakers. Over the past few months, Mr. Koh and I ended up exchanging many emails both on music reproduction in general and the GR360 in particular. I have gathered those snippets of insight in the form of an interview which never took place but could have had we had the opportunity to meet face to face for a few hours. I hope it summarizes accurately weeks of discussions, sometimes from half a world away as our e-mail strings stretched through Mr. Koh's dealing with early production challenges in China and me visiting customers in France, Poland and Hungary. We even compared notes on the best hotels in China - but that's a story for another time. FB: The M60 and I60 received great reviews. Why did you return to the drawing board so soon and explore a completely different design and technology? GK: You have to remember that Genesis is first and foremost a loudspeaker company. The impetus to design the first amplifiers (the M60 monoblocks Srajan reviewed and the I60 integrated Paul Candy reviewed) was as proof of concept that you didn't need megabuck, kilowatt amplifiers to drive Genesis loudspeakers. However, these amps sold out fast because people started buying them to drive other brands of megabuck loudspeakers! There were a couple of shortcomings to those amps when used with other brands of loudspeakers. Firstly, they are not designed to deliver lots of current into low impedances at low frequencies (as a reviewer who tried using them to drive the Talon Khorus discovered). I developed them for Genesis loudspeakers, which mostly have a built-in servo-bass amplifier to power the frequencies below 120Hz. Secondly, most other loudspeakers have a dynamic tweeter with a voice coil. That means a rising impedance in the high frequencies and hence, their high frequencies would be shelved down. Now, this second shortcoming isn't bad because most metal dome or cone tweeters do not behave well at high frequencies anyway and so need to be tamed. My goals for the new amplifier was to deliver everything that the M60 did -- musical, refined, emotional -- plus more. It had to deliver lots of current into low impedances at low frequencies just in case I wanted to develop a full-range Genesis loudspeaker without a built-in servo-bass amplifier. Most of all, it had to deliver a well-recorded musical event as "live" and "immediate". It had to deliver the shimmering sparkle of cymbals, the penetrating blat of horns and the chest-thumping power of a kick drum. And all with the sweetness and warmth of tubes and the control and dynamics of solid-state. 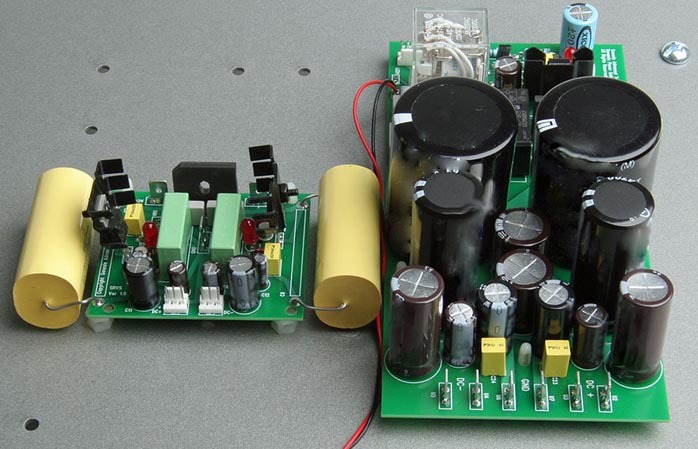 FB: This sounds more like a white paper for a tube amplifier with large current capacity than for a solid-state design - how did you arrive at that choice? GK: Valve amps come with inherent problems. They are fiddly, consume too much power (especially with $120 a barrel of oil! ), generate too much heat and worst of all, the tubes start to fade the moment you turn them on. For audiophiles who like to fiddle they are great because when they change tubes, there's always an improvement - sometimes it's because they are comparing a brand-new tube to something that has 2,000 hours on it. For most music lovers though they are too much trouble. But I didn't want to give up the qualities I love about tube amps - image density, soundstage and ambience; and tonal colors, microdynamics and resolution. 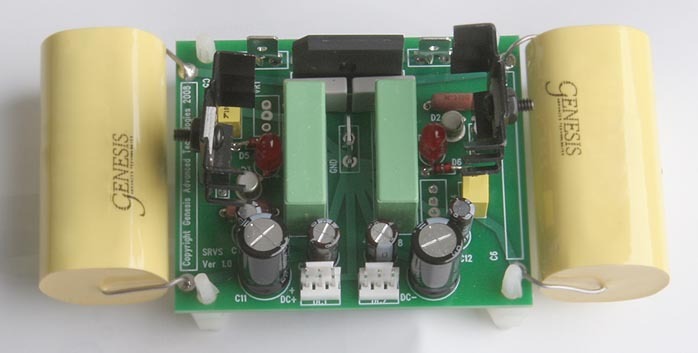 Because I use them as my reference when designing loudspeakers, I also needed short-circuit protection and my new amps also had to drive loudspeakers of less than one ohm (because that's what some of our prototypes start at). Ultimately, the amps had to play music and my musical tastes run the entire gamut. I love big band Latin music (cha cha, bossa nova etc) and PRaT (pace, rhythm and timing) had to be precise and not vary with loudness. Too many amps fail in this department. When the music goes loud, the rhythm changes. I love smoky jazz female vocals and the amplifier had to have the right amount of sweetness but not artificial sweetness because sometimes they are singing of heartache and lost loves. I love small jazz quartets and the interplay and emotional connection that a good quartet will show. Most of all, I love large orchestral works and rock and the London Symphony Orchestra playing Deep Purple! Most of the voicing work was done on the $16,000 Genesis 5.3 but the Genesis Reference Amp (for it to be a reference amp) had to be able to drive a wide variety of loudspeakers - not only those by Genesis with a built-in bass amplifier. For this, I brought the amplifier to some of my dealers so that we could hear how the amplifier would perform in the context of other systems. We tried pairing the Genesis Ref Amps with everything from the high-end to entry-level from horns to panel speakers to large dynamic behemoths - running through the Acapella High Campanile to Magneplanar 3.6 to Revel Performas to Wilson MAXXs. We also tried both tube and solid-state preamps to drive the amplifier - Einstein The Preamp, Melody SHW 1688, Adcom GFP-750 (in both passive and active mode) and the FM Acoustics 255. I wanted to make sure that the amplifier could be used in the context of an entry-level system and one of the systems that I did extensive work with comprised a Slim Devices SqueezeBox, a Benchmark DAC1, the GR180 amp and a pair of G7.1ps with a prototype small subwoofer. This could turn out to be the ultimate sub-$10k system to do everything right! FB: I can see what the goals were but how did you end up choosing the trendy Hypex modules as the heart of your new Reference amplifiers? That's not the first choice that would come to my mind. GK: I didn't realize that the Hypex modules had become the hype lately. It's a long story. 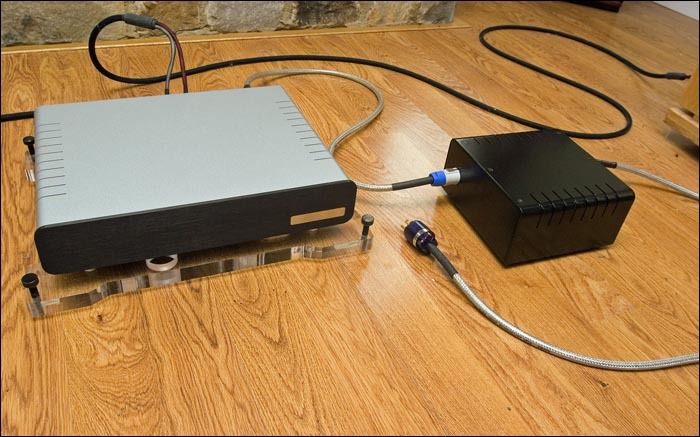 Genesis has been using class D amplifiers for the servo-bass amplifier in the speakers for a long time - since 1995. It's the perfect solution for bass, however those amps were harsh and brittle in the high frequencies. Three years ago I was surveying the available class D technology for a new improved amplifier to go into the Genesis servo-controlled subwoofer amplifier. The first one I considered was the NuForce and then the ICEPower. For various reasons, I settled on the Hypex UcD module for the subwoofers. First, it does not float both positive and negative terminals at a significant voltage above ground (unlike most of the others). I picked this for safety reasons. Second, after a survey of the technology, it seemed to be the most sound. Third, it sounded the best in the bass as well as with full-range music. So I had already started development work on the subwoofer amp. After I completed development of the Genesis M60s and I60 and got my first shipment, I realized that I would not be using that manufacturer in the future and started thinking of the next amplifier to replace them. Once those amps ran out, my dealers and customers still called me regularly for an amplifier. This was also the height of the hype with class D amplifiers, which got me thinking. However, all the class D amplifiers I tried gave me something (usually huge dynamics and a huge soundstage) but mostly took away the intangibles of soul, musicality and tonal colors.